When you plan to leave your apartment, the first and most important thing you could do is to look and hire a home cleaning service provider for your apartment vacate cleaning needs. As a matter of fact, tenants are responsible to restore its condition as it was at the beginning of the lease. And hiring a professional residential cleaning service is the wisest thing you could do. Furthermore, with their help, you can get your full bond back! 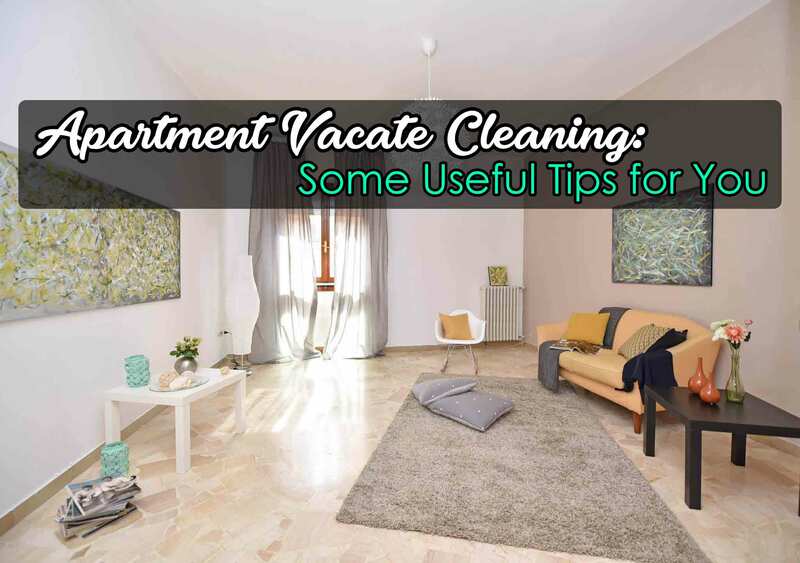 However, if you wish to engage yourself in the task instead of hiring local cleaning services, then we do have some apartment vacate cleaning tips for you. So, just keep reading to find out. Well, always keep in mind that a first impression can set the tone for the rest of the inspection. And a neat and clean house could make all the difference between a hassle-free investigation and an exercise in frustration. So, make sure to check everything and see to it that all are in their original condition. You should be more particular about your doors and windows. Yes, make sure to go out of your way to look for potential damages, no matter how small they may seem. Also, make sure to include to check for dust around door frames, light switches, picture frames, windowsills and of course the sliding tracts. These areas are often the overlooked areas even in the cleanest rented apartment. Shining and shimmering windows could make a strong impression. So, make sure to use appropriate window cleaning tools and do the proper clean-up for an excellent result. Considering that it is one of the prime deciding factors for the new tenants to rent a new home, so having it cleaned is strictly a must. Expect that the inspector will pay close attention to the stoves and ovens. Well, what you could do is to make sure you clean them thoroughly inside and out. Also, don’t forget to check the cupboards and pantries. Mould and mildew might be laying over there. Another area that is considered one of the most critical places to be aware of is the bathroom and toilets. And yes, clean and shiny sinks, mirror, and tiles are perfect to catch one’s eye. Therefore, make sure to check for leaks and any broken objects. Some tenants are often unaware of these and only finds out during the inspection. Don’t forget to have the grout have a proper care as well. Also, remember to clean the shower curtains and replace it if needed. This is one trick to impress your landlord in your apartment vacate cleaning task. Wall marks and stains are always a significant problem. But you can get rid of them easily with simple solutions. However, just be careful not to damage the painting on the wall while you’re in the process of fixing it up. For your floors and carpets, you can use a vacuum cleaner for better results. One more thing, make sure that your lawn also has a proper attention. See to it that overgrown plants and trees have been trimmed. And if there is a garden, get rid of the weeds. But of course, when the ground is secured, don’t forget to look up. Ensure that the corner of the ceiling is free of mould and spider webs. Another thing too, don’t rush when leaving out, recheck everything if possible. You could also ask your owner or real estate agent to provide you with some checklist for your guide. Apartment vacate cleaning isn’t that simple at all. Yes, there are many things that you need to do. So, why take so much pressure if you could have a hassle-free move out? Look for professional help and let them do the task. Just so you know, professional cleaning services team is far better than cleaning on your own. Their experience and tools will get the job done with perfection. And most importantly, they will give you a clean-up receipt that could help you get your full security deposit bond back. This entry was posted in Cleaning Services and tagged Apartment Cleaning, Deep Cleaning, Fridge cleaning, Maid in Perth, oven cleaning, Vacate Cleaning, window cleaning.